Make me a diary and keep it safe. Take care it is mine. Hold this photograph of my face. Keep all our entries in order. Put the letters in your desk file and the images in your evidence locker. You can edit everyone else out. I will fill in the gaps, the parts of my diary you are missing. Since you can’t follow me inside, I will record the inside for you. I will mark the time carefully so you will never lose me. Don’t worry about finding me. I will help you. I will tell you what I was wearing, where I was, the time of day . . . If there was anything distinguishing about my look that day, I will make sure you know. Hold onto my diary for at least seven years . . .
On January 29, 2004, multimedia artist Jill Magid began her thirty-one day “cycle of memory” in Liverpool, UK. Her month-long performance piece would later be exhibited in the installation Evidence Locker (2004) and published as a diarised narrative with entries corresponding to CCTV footage of the artist recorded by and then obtained from Citywatch, the surveillance branch of the Merseyside Police. The United Kingdom can memorize you: Robert Knifton writes that “[f]or the contemporary British city-dweller, CCTV surveillance is a fact of the urban fabric.” The country’s metropolises are responsible for a fifth of the world’s surveillance technologies, technologies which capture the individual on average three hundred times per day. After five years exploring CCTV systems and the institutions they represent in her native US and abroad in Amsterdam, Magid arrived in Liverpool, sidestepped the political sore-points, and dove directly into the system memory. If you were to approach me and ask me what my desire looked like, I would say that it looked like us, here, now. Does this mean that I can desire anyone? From the manner of your approach, I am aware that you recognize me, as a subject, with my own desire. In this position, I am able to recognize you, with your own desire, before me. A space encompassing the two of us opens up and there arises the possibility of a between-us. To be a container is to be an actively open space. In sexual terms, men are considered to be the active “penetrators,” while women are identified as the passive sites for penetration. Being an active container, though, means to escape this subject-to-object constructed subordination. A woman's container—as her own—is neither static nor passive. She does not have to play the masochist waiting for her ideal lover to penetrate and reveal her. She reveals herself. She develops an active container, an Inside. From here, she is secure enough in her own identity to challenge it. As she releases herself, she holds onto herself (as a container) and, in doing so, retains and fortifies her authorship. For Magid, reciprocal desire is the recognition of each of the other, the subjective confirmation reflexively performed between an I and a you, the performance taking place within and opening up a space (as she identifies it) between-us. Alain Badiou resolutely argues that “there is no third position” for two individuals to occupy by becoming two through a desirous interaction, but perhaps this space can instead be read as a site in which desire is localized, acted out and upon, and in which recognition—-which requires by definition an outward directive—-can occur. Desire presupposes a need for space: it insists upon a physical locality. Whether desire occurs at the closest proximity (sexual contact) or across the greatest voyeuristic distance (unrequited love, fetishism), there is always a corporeal space created between the two, or between the desirer and the desired. The Platonic ideal of merging two into one is an unattainable reality, no matter how fervently this romantic notion may inflame and propel our desire. There will always remain the space between-us, even if that space should be reduced to one no greater than the frictional space between skin. Mimetic correspondence has a psychic appeal because one seeks a self-image in the representational frame. Mimetic representation requires that the writer/speaker employs pronouns, invents characters, records conversations, examines the words and images of others, so that the spectator can secure a coherent belief in self-authority, assurance, presence. Memory. Sight. Love. All require a witness, imagined or real. The memory of the city is fleeting, unreliable, ephemeral. In Liverpool, Citywatch holds footage captured by the town centre’s 242 cameras for a retainer period of thirty-one days, before it “cascades off the system” in accordance with the Data Protection Act of 1998. In order to escape the cycle, footage must be requested as evidence through the completion of a Subject Access Request Form (SARF); the law stipulates that any footage supplied through this procedure must then be committed to an evidence locker for a further seven years. Magid completed thirty-one forms, each written as a love letter to the “Observer,” transforming the bureaucracy of the faceless institution into an intimate epistolary account of romantic memories. In the CCTV footage she obtained from the police, exhibited as Evidence Locker, Magid exploits the potentiality of the surveillance camera, refigures the subject/object dichotomy, and translates ways of seeing into ways of remembering. I met you today. I came to your office. You had been informed of my arrival . . . You wrote a path on my map. I followed it. I got tea at Café Nero and wrote a postcard. You watched me, from two angles, when I did this. You followed me through the centre of town, on the streets without the cars. I walked in circles around your feet and your neck got stuck. It was funny to see you following me. You constantly moved to meet me. The incorporation of the lover’s gaze into the gaze of the CCTV camera, coupled with Magid’s deliberate use of language that confuses those operating the cameras with the cameras themselves, opens up a discursive space between Magid and her observer(s). Magid’s letters serve a dual purpose: as unorthodox but acceptable SARFs, they ensure that thirty-one recordings of Magid are kept on file; as écrits in a lover’s discourse, they secure the attention and interest of the observer. As a result, their interaction becomes more intimate, and by the end of the novella, as the observer transports Magid in person out of the city, their transcribed conversation is fluently romantic. You said, You don’t like goodbyes do you? I said, No, I don’t do goodbyes. I act like I will see you later. We embraced. I kissed your cheek. I can’t recall if you kissed mine. I went to the door and went inside. Bye. My plane leaves in three hours. Throughout Evidence Locker, the spaces of the city and the spaces of memory are aligned through the body as intermediary, a body moving within the space of desire and also held within the memory of desire. Magid becomes herself as container, as “actively open space,” an actor in the middle ground mediating between the city (objective, impersonal, unmoving) and the memory or memories of her observers (subjective, embodied, fluid and prone to lapses and loss). The fortification of authorship Magid calls for highlights the role of the artist in contemporary art practice, especially in work which so crucially relies on the intersubjectivity of observation. Who here authors the art, the observer or the observed? Gilles Deleuze and Felix Guattari encourage a world view that accepts life as a myriad of representation in its multiplicity and interconnectedness. Our thoughts construct our world, and “thought is not arborescent” but rhizomorphous. Deleuze and Guattari write, "A rhizome ceaselessly establishes connections between semiotic chains, organizations of power, and circumstances relative to the arts, sciences, and social struggles." The postdigital represents a breakdown of the authoritarian structures which guide traditional narrative practice . . . The individuated yet networked mode of engagement of postdigital media circumvents authorial regulation. It is rhizomatic, the barriers are porous. How could fictional narratives be so effective in creating visions of reality and beat the narratives of truth-speak in their authenticity? Yet . . . they opened up my world, importing into it creatures emerging from a tangible, sensuous language that told me a thing or two about what mattered outside my own subjectivity. From these figures made of words, I learned the value of that imaginative, everyday democracy called intersubjectivity [emphasis in original]. You told me a story about Auschwitz. I have been there too. I did not take pictures but you did. I told you about the feeling I got there, the first time I felt evil—in the gas chambers—like there was black tar running down my back, beginning at my neck. You had more distance. You held your camera. You said you did not feel as close to it then. You said now, when you look, you feel the power of what you filmed because it’s like seeing it with your eyes. And in an earlier entry: "They told me that sometimes you drive around at night in a van and film people. You make a history of everyone you see so that you can remember them later. Do you remember them? Or do you forget them because you film them?" In both cases, the body plays the role of active container, in which knowledge of the first space is carried through to the second. Representations of places and faces travel via the vessel of human observation without touching the sides to be deposited in memory, one which is artificially held. Magid employs this artificial memory to her advantage, gaining new objectivity (or as close as is possible) to her position as subject within environment, as a space within space. She tells her observer, “I am your subject; I relate myself to the city by the way you frame me in it.” Here, the entangling of subject and space is made uniquely possible through the memory of surveillance methods, a memory rendered so close to objective because of the cameras themselves, static and often unmanned. Magid repeatedly refers to the observer having remembered but not watched the footage: the true observation and reinsertion of the subjective gaze only comes after the remembrance has taken place. This kind of memory can only exist in terms of the technologies and media used in surveillance. While Phelan insists that “the formation of the ‘I’ cannot be witnessed by the ‘eye,’” Magid manages to revisualize this paradox, recasting the roles to become at once the I (eye) and the Other (eyed), the desirer and the desired, the witness and the event. The difference between [short-term and long-term memory] is not simply quantitative: short-term memory is of the rhizome or diagram type, and long-term memory is arborescent and centralized . . . Short-term memory is in no way subject to a law of contiguity or immediacy to its object: it can act as a distance, come or return a long time after, but always under conditions of discontinuity, rupture, and multiplicity. Furthermore, the difference between the two kinds of memory is not that of two temporal modes of apprehending the same thing; they do not grasp the same thing, memory, or idea. In Evidence Locker, Magid highlights these ruptures in memory, entry points which make possible (and essential) a range of authorial voices, the technique of co-creation on which modern art so fundamentally relies. If we work from the aforementioned statistics, Magid’s performance took place on a pre-existing stage, within the scopic region of 242 cameras whose cinematographic control was out of her own. Her image was captured approximately three hundred times per day (9300 times over the month). Most of this imagery was lost to the short-term cycle inherent to the system memory; the rest was retrieved and returned to her in media format. Some of the recorded footage was watched live by a team of observers (a primary range of subjective authors); a great deal of it went unobserved between its being remembered and being re-presented to her. The installation exhibited selected footage chosen by Magid, presumably for its artistic value in relation to her own subjective experience of viewing herself and in line with her prior ideas and expectations of the project. This re-presented footage was then reliant on the subjectivities of an unprecedented audience, one made up of any number of observers, of potential co-creators. Authorial boundaries are broken down in the most beautiful of ways in a piece that speaks of the loss of control, the giving over of that control willingly, and the admission of the necessity of relationship and relativity. Magid oversteps the boundary between short- and long-term memory, managing to see herself independently from a rhizomatic viewing system, one which can forget her or remember her, depending on the rhizomes of memory and their response to their invitation into the artistic process. Working within the confines of what Deleuze and Guattari term “[t]he splendour of the short-term Idea,” Magid harnesses the objective memories of the system and escapes its terms of oblivion, escapes the cycle to gain access to and situate herself within its long(er)-term memory capacity. In Evidence Locker, Magid manages to represent the perpetually short-term memories that a city, a team of observers, and then an ever-expanding audience experienced of her—for as rhizomatic narratology dictates, “one writes using short-term memory, and thus short-term ideas, even if one reads or rereads using long-term memory of long-term concepts.” This is shown by Deleuze and Guattari in their own example of rhizomatic writing, mapping by association a route through concepts as diverse as "The West . . the East . . . Oceania . . . God . . . Transcendence . . . Henry Miller . . . no lilies, no battleships, no Sermons on the Mount . . . the Dark Age . . . The old China, the new, an imaginary one, or yet another located on a shifting map . . . ."
The beauty of the rhizomatic narrative is its ability to hold in its midst conflicting concepts, concepts of differing temporal and spatial positions—it can align temporality and spatiality simultaneously; one can conceive of both, of many, because the rhizome is “alliance, uniquely alliance.” In its multiplicity of viewpoints, of inserted gazes and contained memories, and of exchanged desires, Evidence Locker exemplifies the rhizome at furious work in the new narratives of modern, co-creational artworks—it “has no beginning or end; it is always in the middle, between things, interbeing, intermezzo.” Jill Magid is the artwork, the evidence locker, the active container authored by the rhizomatic memories of others. She is the “and . . . and . . . and . . .” character of a new breed of narrative. Seen and revealed from every angle, angles previously inaccessible to her, Magid’s self-representation takes place in terms other than her own. Magid diarizes to remember, and to help others remember; not only does Magid leave Liverpool with her memories of the city, she also leaves the city with memories of her. Jill Magid, One Cycle of Memory in the City of L (Liverpool: Biennial International, 2004). Robert Knifton, “You’ll Never Walk Alone: CCTV in Two Liverpool Art Projects,” in Conspiracy Dwellings: Surveillance in Contemporary Art, ed. Outi Remes and Pam Skelton (Newcastle: Cambridge Scholars Publishing, 2010), 83. BBC News, “Britain is ‘Surveillance Society,’” 2 Nov 2006, http://news.bbc.co.uk/2/hi/uk_news/6108496.stm. Jill Magid, “Recognizing Desire,” in Thresholds 19 (1999): 75. See Alain Badiou, “What Is Love?” in UMBR(a), issue 1 (New York: University of Buffalo Press, 1996): 40. Peggy Phelan, “Broken Symmetries,” in The Feminism and Visual Culture Reader, ed. Amelia Jones (London: Routledge, 2003), 108. See Jill Magid, “Theology of Mirrors,” 2002 (sourced at: http://www.jillmagid.net/TheologyOfMirrors.php). Jill Magid, “Seduction,” 2007, http://jillmagid.net/Seduction.php. See Elizabeth Rubin, “Jill Magid” in Bidoun, issue 10, 2007 (sourced at: http://bidoun.org/magazine/10-technology/jill-magid-by-elizabeth-rubin). The SARF duplicates make up the body of Magid’s diary, entitled One Cycle of Memory in the City of L.
 Jean-Paul Sartre, Being and Nothingness (Oxon: Routledge, 2008), 246. Magid, One Cycle of Memory in the City of L, 7. 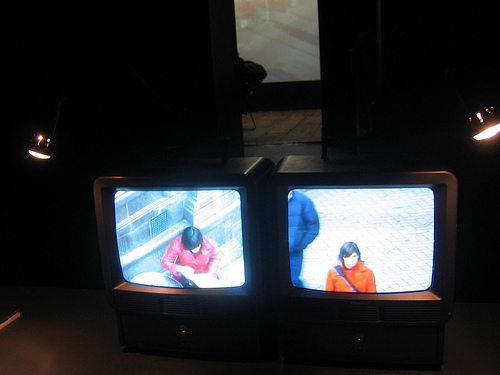 Though the SARF letters are addressed to the “Observer” (singular), it is safe to assume that this could be the personification by the artist of a number of operatives on the staff at Citywatch, and beyond the performance, the installation footage and publication have been “observed” by her wider public (infinitely plural). Gilles Deleuze and Felix Guattari, A Thousand Plateaus (London: Continuum, 2009), 8. See Steve Nash and Amy Christmas, “Rhizomatic Narratology and Videogame Culture,” (co-authored with Amy Christmas) in the 2nd International Akşit Göktürk conference proceedings (Istanbul: İstanbul Üniversitesi, 2012). Mieke Bal, A Mieke Bal Reader (Chicago: University of Chicago Press, 2006), xvi. Magid, One Cycle of Memory in the City of L, 23. Deleuze and Guattari, A Thousand Plateaus, 17. Amy Christmas is a final-year doctoral student at York St John University, researching representations of love in science fiction texts. Her work on Jill Magid has previously been published and presented at the University of Liverpool and the Estonian National Museum.